Aspen — Colorado: Aspen is one of the most famous areas for skiing in the United States. It is a resort community located near the Rocky Mountains in Colorado. Aspen averages over 26 inches (67 centimeters) of snow per month during their ski season. Aspen also boasts an upscale downtown area where visitors can dine at high-end restaurants and shop at fashionable boutiques from designers such as Louis Vuitton, Dior, and Prada. Boulder — Colorado: Boulder sits at the base of the Rocky Mountains and is only 40 minutes away from Denver, the capital of the state. Boulder is decidedly less expensive than Aspen but has its own unique charm. Visitors will find a thriving artistic community and welcoming cafes. It is no slouch when it comes to the slopes either. The nearby Eldora Mountain Resort is famous for its challenging trails. Telluride — Colorado: Telluride is becoming a popular destination year round but it really made its name as a place for skiing. There are over 1700 acres of land specifically for skiing. Resorts include The Peaks Resort, Mountain Lodge, and the Telluride Ski Resort. And the area's numerous ski trails are all nearby. Vail — CO: Rounding out the famous Colorado ski areas is Vail, historically one of the best known ski destinations. It is home to the country's largest single-mountain resort, The Vail Ski Resort. When skiers describe Vail, the first word that comes to mind is "size". There is no shortage of trails with many of them offering extended hours as the season goes on. Be sure to visit the Colorado Ski and Snowboard Museum. You can learn about all of the major ski records and persons of honor in their Hall of Fame. Stowe – Vermont: Stowe is nestled between two mountains in the State of Vermont, the Green Mountain and the Hogback Mountain. Stowe is decidedly New England in its appeal. You will find quaint restaurants and general stores. In the autumn, visitors come for the Leaf Peeping. Then, when it is time to hit the slopes, you can visit the Stowe Mountain Lodge, the Mountain Road Resort, or one of the other numerous ski resorts. Lake Tahoe — Nevada: Las Vegas is the most popular tourism destination in Nevada but at the northern part of the state, you will find Lake Tahoe. Snow does not immediately spring to mind when you think of Nevada but Lake Tahoe is in the north and gets about 400 inches (or 1000 centimeters) of snow per year. Thousands of people flock to Lake Tahoe every year to experience the ski slopes and take a look at Tahoe's panoramic beauty. Pocono Mountains – Pennsylvania: These trails are generally tamer than the slopes you will find in other popular destinations. They are gently sloping, wide trails, ideal for beginners or skiers looking for a more laid back atmosphere. However, experts can still find challenging slopes at one of the area's dozen or so resorts. Salt Lake City – Utah: Salt Lake City was the home of the 2002 winter Olympics. The city built Utah Olympic Park to host the events. Visitors can purchase inexpensive tickets to go skating and visit the Utah Ski Museum. Then, you can hit the slopes at one of seven different mountains with beautiful resorts dotted across each one. Jackson Hole — Wyoming – Jackson Hole is valley in the Northwest area of Wyoming, home of the famous Jackson Hole Resort and the Four Seasons, Jackson Hole. It has become a popular destination for skiers, with snowfalls recorded at up to 20 inches (50 centimeters) per month at the peak of the ski season. Adirondack Mountains — New York: From upscale cabins to more low-key resorts and lodge, this area near the Adirondack Mountains has something for everyone. 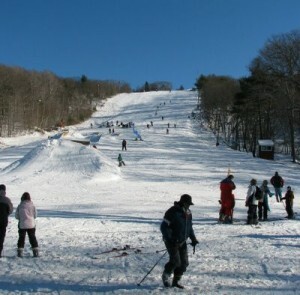 Visitors come from across New England and the state of New York to experience the snow and lake activities here. Snowmobiling is a fun and popular activity in the Adirondacks.